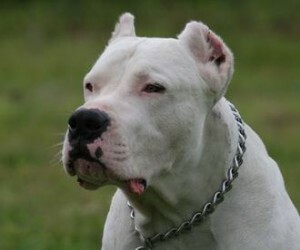 Television viewers in the Denver area may have been in disbelief when they saw a Dogo Argentino bite the face of a news anchor, Kyle Dyer, on live TV on Valentine’s Day, 2012. A morning talk show in the Denver area was conducting an interview about a Dogo Argentino dog, named Max, who was dramatically rescued from an icy pond by a firefighter in the snowy backcountry near Denver. T he rescue was broadcast live by helicopter live on local television. The heroic firefighter saved the dog by walking on a precarious section of ice to where the dog was swimming to stay afloat. Read more about the Dogo Argentino on Wikipedia. The next day Max appeared on a morning TV show with its owner, Michael Robinson, along with the firefighter who did the rescue. During the interview, the dog was being held by its owner by the collar (not on a leash) several feet from the newscaster, who appeared to be kneeling in front of the dog. She was sweet-talking, dotting, and petting the dog’s head. This carried on for about 20 seconds, and then she moved her face closer to the face of the dog for the purpose of wishing the dog “Happy Valentine’s Day”! When this happened, the dog snarled, and then quickly thrust it head slightly forward and inflicted a single bite to the Dyer’s face. Immediately after inflicting the bite, the dog was pulled back by its owner and it appeared frightened. 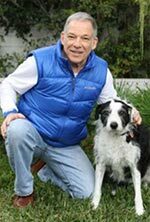 Dyer, a well-known animal advocate, received 70 stitches and will require further reconstructive lip surgery. The photograph to the left shows the bite mark in the center of Dyer’s upper lip. Visit YouTube where several videos of the attack may be posted. Michael Robinson is now facing criminal misdemeanor charges. According to county law, Max caused bodily injury to Dyer because he was “off the premises of the owner but yet under control the owner”. This seems to be a rather strange law, to say the least! This is the situation where the dog may not have been expecting this kind of action from Dyer. Although it probably appeared to many that Max was fine. However, he probably was not. For example, if one looks closely at the video, about 5 seconds before Dyer moved her face closer to Max, he subtly turns his head in avoidance. In a sense, Max was cornered but tolerant of the newscaster’s interaction. However, the dog’s attitude quickly changed the moment Dyer brought her face close to the face of the dog.Sudden movements by a person to a dog, particularly bringing one’s face close to the face of the dog, may not be expected by a dog. When this happens some dogs will react with a single defensive bite. Fear-based reactions like this happen to restore a dog’s “comfort zone”, or more technically speaking its behavioral equilibrium. Generally, dogs like predictability in their lives, and based on past experiences, they use their cognition to anticipate events. If what happens is discrepant from what it expects, then under certain circumstances and for some dogs, an aggressive reaction will occur to restore conditions back to what the dog expected, or what it can cognitively tolerate. Did the newscaster provoke this Dogo Argentino dog bite? Whether this action by the news anchor constituted “provocation” cannot be said with certainty. For example, it is not known if the dog had prior aggressive tendencies, or if the dog had previously acted like this when confronted with a stranger’s face at close range. Most dogs can tolerate this kind of action. For example, many people kiss their dogs or talk to their dog face-to-face without problems. If it is smart for a person to do this to a relatively unfamiliar dog in these kinds of circumstances, particularly if the dog is large like a Dogo Argentino, probably was not very smart.